Kasco Marine offers both fountains and aerators. Below are some of our most popular models. For additional fountains that may be available, please visit the Kasco Marine web site. V-Patterns provide aeration and display. At 300-400 gallons per minute, they are effective at destratifying ponds with a pleasant display and sound, maintenance free, excellent for small ponds and coves, easy to install, and operates in as little as 18 inches of water. Each fountain comes with 100 feet power cable, two 50' ropes, weatherproof control panel, 24-hour timer, top and bottom screens and GFI. Use the economy light kit for a nighttime display. V-pattern fountains are salt water tolerant, come with a 2 year warranty and are UL and ETL listed. Five patterns ranging from 7' high and 20' in diameter. Kasco Marine's 8400JF, 2 hp Floating Aerating Fountain or Decorative Fountain Aerator is great for larger ponds or when multiple large patterns are desired. The Kasco 8400JF Floating Aerating Fountain is unique for its size, in that, it comes standard with 5 interchangeable nozzles and can be operated without a nozzle to give you 6 FOUNTAIN PATTERNS FOR THE PRICE OF ONE! The 6 fountain patterns range from 22' in height to over 40' in diameter. Click here for more information. Kasco Marine's NEW 8400VFX, 2 hp Floating, Aerating Fountain or Decorative Fountain Aerator is great for larger ponds. The classic Kasco "V" fountain pattern, 8' tall x 32' wide gives this model a beautiful fountain pattern. The larger motor and enhanced propeller design gives the 8400VFX 2.5 times the water flow as the 4400VFX. Kasco's 8400VFX Floating Aerating Fountain does an excellent job at adding oxygen and improving your pond or lake aeration. The floating, aerating fountain pattern will assist in improving your water quality as well as adding to the aesthetic appeal of your pond. The 8400VFX Floating, Aerating Fountains are available in 240V, 60Hz models. Click here for more information. Kasco Marine's NEW 3.1JF, 3 hp Floating Aerating Fountain or Decorative Fountain Aerator is great for larger ponds or when multiple large patterns are desired. The Kasco 3.1JF Floating Aerating Fountain is unique for its size, in that, it comes standard with 5 interchangeable nozzles and can be operated without a nozzle to give you 6 FOUNTAIN PATTERNS FOR THE PRICE OF ONE! The 6 fountain patterns range from 24' in height to over 45' in diameter.. Click here for more information. Kasco Marine's NEW 5.1JF, 5 hp Floating Aerating Fountain or Decorative Fountain Aerator is great for larger ponds or when multiple large patterns are desired. The Kasco 5.1JF Floating Aerating Fountain is unique for its size, in that, it comes standard with 6 interchangeable nozzles and can be operated without a nozzle to give you 7 FOUNTAIN PATTERNS FOR THE PRICE OF ONE! The 7 fountain patterns range from 26' in height to 50' in diameter. Click here for more information. 5HP Pond Aerator, 18 running amps, 240V Single Phase, 3 piece float with mooring ropes, available with 100', 150', 200', and 250' power cord. Roughly 15 lbs of oxygen per hour of operation. Requires 26" of water. 2 year warranty. 5HP Aerating Fountain, 20 running amps, 240V Single Phase, 3 piece float with mooring ropes, available with 100', 150', 200', and 250' power cord. Over 800 GPM single "V" shape pattern 9' tall x 34' wide. Requires 26" of water. 2 year warranty. 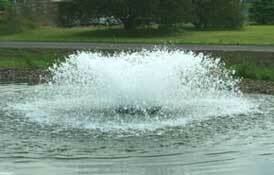 Multiple Pattern 2 Horsepower fountains provide high flow rates and have a versatile display. Excellent Price!They operate in 20 inches of water and includes 6 interchangeable spray patterns!! Display ranges from 15 feet high to 30 feet wide and are maintenance free. Each fountain comes with 100 feet power cable,.three 50' ropes, weatherproof control panel, 24-hour timer, top and bottom screens, GFI, lightning arrester and transformer for optional light kit. Multiple Pattern 2 horsepower fountains are salt water tolerant and come with a 2 year warranty. Additional fountain power cable up to 200 total feet available. New Lighted Fountain/Aerators will beautify any small backyard pond or water garden. The 1400JFL Floating Aerating Fountain is not only a NEW product in Kasco Marine's product line, it is also a new design. This new floating fountain design allows for 5 interchangeable nozzle heads and LED lights, while keeping a low price to our customers. Additional decorative nozzles for any Kasco 2HP 8400JF, 3HP 3.1JF, and/or 5HP 5.1JF. Easily retrofitable to previously installed units. Each nozzle sold separately. Click here to see patterns and names. Includes three 12V lights, three MR16 lamps and three clear lenses for an outstanding display. Lights are operated by a photocell, and each light is encased in brass. Standard 100 feet of power cable. New colored halogen bulbs for light kits! Aerators stimulate the natural biological process necessary for clean, odor-free water. Proper aeration is key to maximizing the overall health of your pond. Aeration provides high oxygen transfer at low cost, decrease fish stress and susceptibility to disease, increases fish growth and population density. Aeration also retards algae growth and thermal stratification. These aerators provide high oxygen transfer and come with black float ring, bottom screen and standard 50 feet power cord. These produce a crown of foam at the surface and oxygen at a rate of pounds per hour. Macro-Zyme ™+ is a totally unique blend and is the pond professionals choice for building and maintaining a healthy pond, water garden, and bio-filter. It is a blend of highly concentrated natural bacteria and enzymes that rapidly biodegrades sludge, improves water quality, decreases suspended particles and solids, removes Chlorine and Chloramines, and eliminates odor. It also reduces or eliminates Ammonia, Nitrite, Nitrate, and Phosphate. Once introduced Macro-Zyme ™ + quickly and effectively accumulates harmful organic material to the bottom of the pond where billions of beneficial bacteria work around the clock to neutralize and purify the water. Click here for more information.